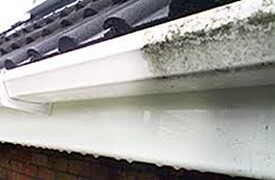 Many houses with upvc gutters,fascia and soffits will find over time the upvc can look dull and worn due to build up of dirt. Using our purified water fed pole system we can clean off all dirt,grime and alage ensuring a pristine appearance to the exterior of you property. Our water fed pole system enables the cleaning of any awkward to reach areas of upvc on your property.